With that, this ends the opening scene of the first chapter of Long John. We’re going to keep up with regular updates through to the end of this first chapter––which is still a ways away, so don’t worry. Once the first chapter comes to a close I’ve got a little surprise diversion planned, but I can’t announce that for a few more weeks yet. Interestingly, this also marks the one-month anniversary of Long John going live on the internet. Happy birthday, then? Woo! Usually I don’t have a problem starting stories. Back in my less-focused days as a writer, my problem was cliche: I could start stories like nobody’s business, but following them through to beyond the beginning was what stymied me. Like I’ve said before, the opening images of this scene have been around for almost as long as the character himself. I reworked this opening many, many times until it ended up in the state it’s in now. My biggest problem was having faith in the audience which ignited my own self-doubt: is it too cryptic? Is it too impressionistic? Is it actually important? Does the dialogue actually give the readers any sense of the characters? All the questions that, ultimately, a writer should be asking, but not at the initial drafting stage. Even when all the art was done, there have been severe revisions with regard to dialogue and lettering in general. For awhile, captions filled the pages that were devoid of dialogue, even though they weren’t written to have any. Part of this was an outcropping of trying to find the voice of the comic. Should we let the acting of the art carry the weight of the scenes or should we go inside Long John’s head? What will going inside his head accomplish? Does it help with the story I’m trying to tell? 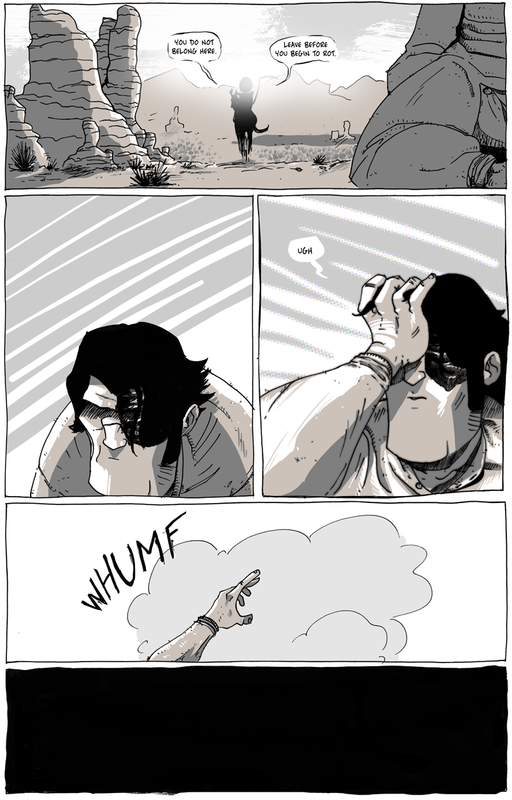 Inversely, does having nothing but silent pages help the story I’m trying to tell? These questions (and more) wind through my brain with every line I put down on the page. I think all of this doubt is pinned by a single worry that, I think, is still completely justified: can I get people to read a comic that’s a western that doesn’t have any sci-fi or horror tropes attached to it (I mean, aside from the lady wearing a skull on her face and carrying a scythe)? It’s still too early to tell. Though it has only been ten pages, the nature of it being a webcomic that releases twice a week is that the experience slows down tremendously. But what of this creepy Hellrider character? We have definitely not seen the last of her––and there will be some exciting announcements that involve her (but are not about her) that I’ll be making in a few weeks. Stay tuned for that! To appease the masses until then, here’s the first design of Hellrider Jackie (as I’ve come to know her) that captured her character though she has changed in ways since then. 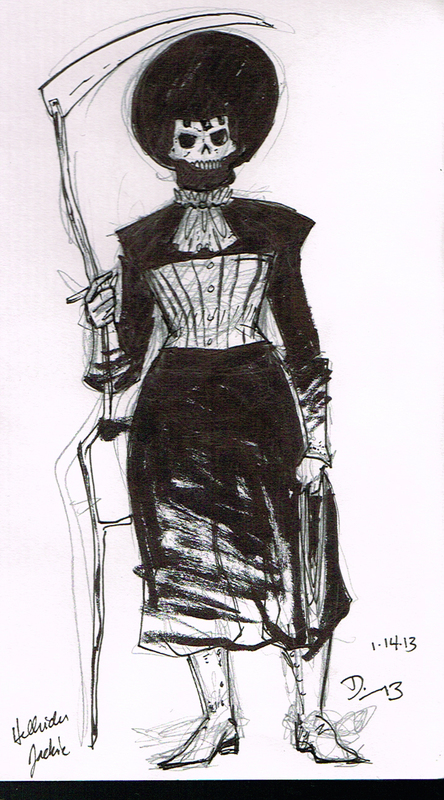 The first “real” character sketch of Hellrider Jackie. Starting next week, Long John will start to look and sound a bit more straight-forward. In other words, people start showing up, but not before the mystery deepens just a little bit more. First, Nicole, my wife, for being my first sounding board for logic and for combating self-doubt. Second, Phil “Frumph” Hofer for helping me getting the website up and running and for combating self-doubt. Next, to my early readers who provided encouragement, feedback, and helped me combat self-doubt: Josh Tobey, Lauren Monardo Gramprey, and Ben Schwartz. Lastly, the support from good friends and fellow creators have helped to combat self-doubt and keep me going as well (in no particular order): Jason Tudor, Melissa Pagluica, Andrew Asplund, Brad Diller, David Hickman, Moon Mullins, Desirae Linder, Eben Burgoon, Anita Scharf, Catherine Fraga, Shelley Blanton-Stroud, Sean Murphy, Susan Fanetti, Vince LoGreco, and many more. If I’ve forgotten your name, please don’t take it personally, but please know you aren’t forgotten nor ignored. Thank you all, from the bottom of my heart for your support. It has meant the world to me. But enough dilly-dallying! Come back Tuesday for the next, brand new page! Wow, I made the list! I’m liking what I see here (in your work, that is)!! Thanks, Anita! Of course the 149 made the list!